Welcome July! Summer is at the door, do you feel ready for it? 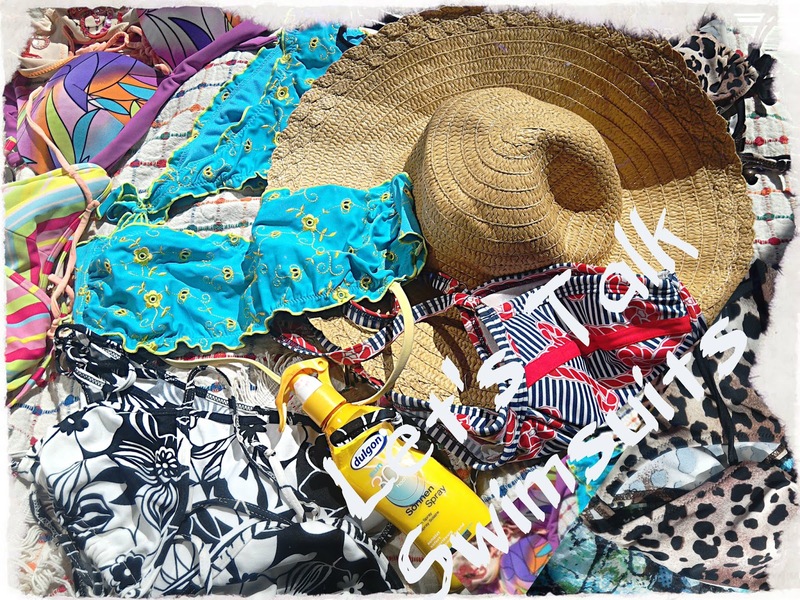 Today we'll be talking about one summer essential and that is: a swimsuit. Choosing a swimsuit plays an important part in getting ready for beach. What kind of swimsuits do you like? Do you like bold colours or do you prefer neutral ones? Do you have any favourites or preferences when it comes to colour and cut? Do you follow trends when it comes to swimsuits or do you just choose what suits you and stick with it? Do you plan to try something new this summer or keep to what works for you? For example, I've been wearing bikinis for ages but I'm currently looking for a one piece because I have a new scar I want to cover up, but who knows perhaps I'll fall into my old pattern and order a bikini instead. I'm also open to trying trikinis. Let's say I'm still undecided but judging on what I've been seeing lately, I have a feeling I'll make my mind soon. Who knows maybe I will order a one piece, a trikini and a bikini? I do like swimwear. There is no reason why we shouldn't be stylish while vacationing. Speaking of swimwear I own, today I'm going to show you my bikini collection. I'll share both what I want and what I already have. 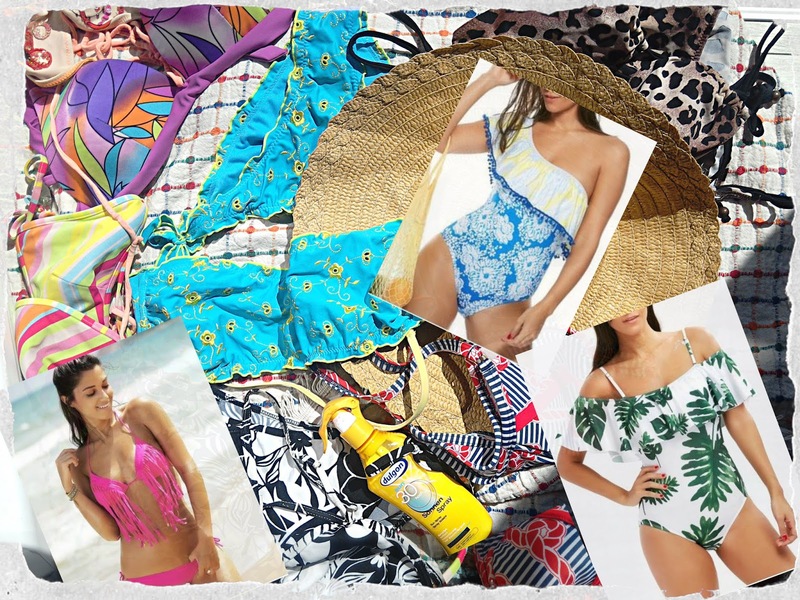 To create swimsuits wishlists, I've collaborated with Rosegal site. For inspiration, I turned to my fashion illustration. 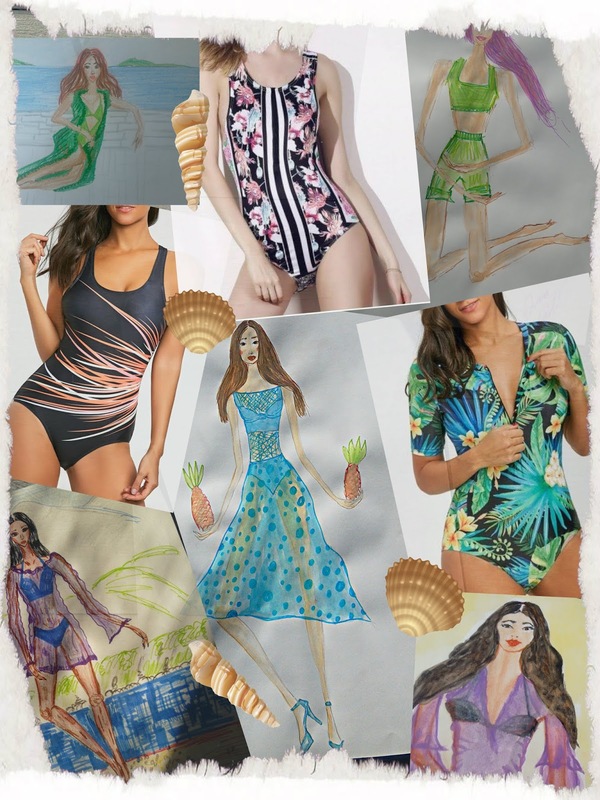 I enjoy illustrating swimsuits, and there were a few swimsuit models that I kept drawing again and again, so it's good to see that someone already made them, so that I don't have to ( I don't know how to sew swimsuits anyway). 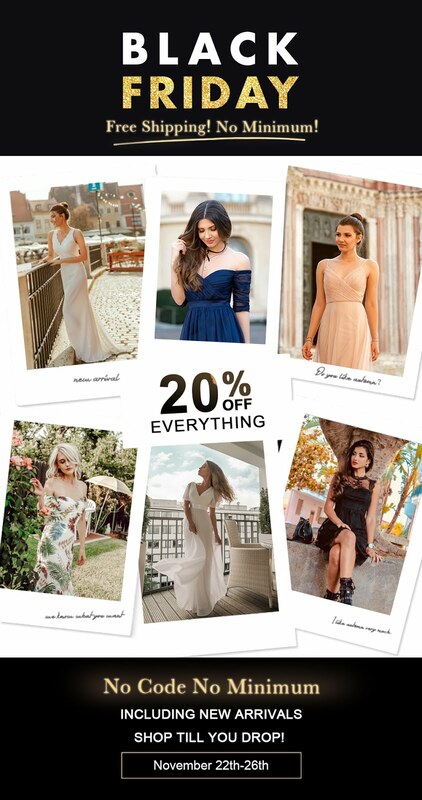 Illustrations help me narrow down my choices. If there is a swimsuit design I keep illustrating, the chances are good that is the right swimsuit design for me. That's my logic anyway Anyhow, the collage you can see above features three one pieces, all of them printed. The first one has a more subtle print, just a bit colour against the black. The second one is a mixed print, a combination of stripes and florals reminiscent of D&G designs. The third one piece is a bit different, it comes in a tropical print, but it also has short sleeves that makes it stand out. This time of swimsuit design might offer some additional protection for those of you with sensitive skin, but don't forget that sun protection products are a must. Now let me show you my swimsuit collection! Basically all the swimsuits I own are colourful bikinis. Going through my bikini collection, I must notice that I have a soft spot for patterns: animal print, geometric print, floral print, navy print, stripes. Printed swimwear is obviously my thing. However, athing I love is a classical black bikini. I own only one, but I wear it pretty often. In the past, I used to go for light coloured bikinis (I loved white and yellow ones) but I realized that with time they can become a see through so it is better to stick with printed or dark bikinis. Right now, as you can see most of swimwear I own is printed, so I don't have to worry about it being see through. Is there any trend you're excited about trying out? There are quite a few exciting swimsuit trends this year, right? The ones that caught my eye the most are (not surprisingly) bold pattern ones. Prints that seem to be trending the most when it comes to swimwear are: polka dots, floral and fruit prints. Stripes are always trendy in my book, for what says summer better than navy print and stripes? Just like with clothes, swimwear has its classics, and you probably won't make a mistake if you you opt for a classical model. When it comes to swimwear details often make all the difference. A bit of ruffles can make all the difference. Embroidery is also breaking into swimwear, especially one simple embroidery technique known as smocking. As you can see, I already have one embroidery bikini, but I might order another one. So, tell me...Do you like summer? Are looking forward to it? What kind of swimsuits you do normally wear? How do you like my picks? What should I order? Is there such a thing as having too many swimsuits? That would be all. Thank you for reading and have a fantastic weekend! Great round of choices here. I could use a new swim suit. And that palm leaf one is so adorable. Love the ruffle! Oh they are lovely printed pieces! :) Bikinis have been my go-to for a while. I briefly tried the one piece but I just feel more comfortable in a bikini, even with my weird belly post babies haha. I have several scars on my stomach, my last one is enormous so I'm thinking about trying a one piece but I'm still undecided. Love their style and color. Have a lovely day and happy weekend! I always wear one piece swimsuits, I've actually just ordered 2 for my holiday now. I can't wait to try them on! great, I hope you'll love them. Adoro l'estate... felice giugno Ivana! In love with all those swimming suits! I love the swimsuits that you have chosen. They are all so cute! "What kind of swimsuits do you like?" - i can answer your question easily. i dont like swimming. i would never go swimming in a sea or a water park. but for lying in the sun (sometimes) on hot summer days i have to choose a bikini or a swim suit - a wear both. but i like swim suits more. the look of it is not so important for me: it could be a floral print or one colored.